The new season will be starting soon….is your team and gym ready? Athletic Seating is the number one choice for custom sideline and locker room chairs and stools! With over 25 years in the seating business, we have a model chair and unbeatable prices for your team’s needs. We feature the Clarin Model 3400 Chair, the industry standard. With a very comfortable 3? padded seat, and custom printing of your team’s logos, and with a great 12 year warranty on the chair, you can’t go wrong. Just ask the hundreds of sports teams that have purchased the same chair. your team can have the same chair that the many pro, college, and high schools use. 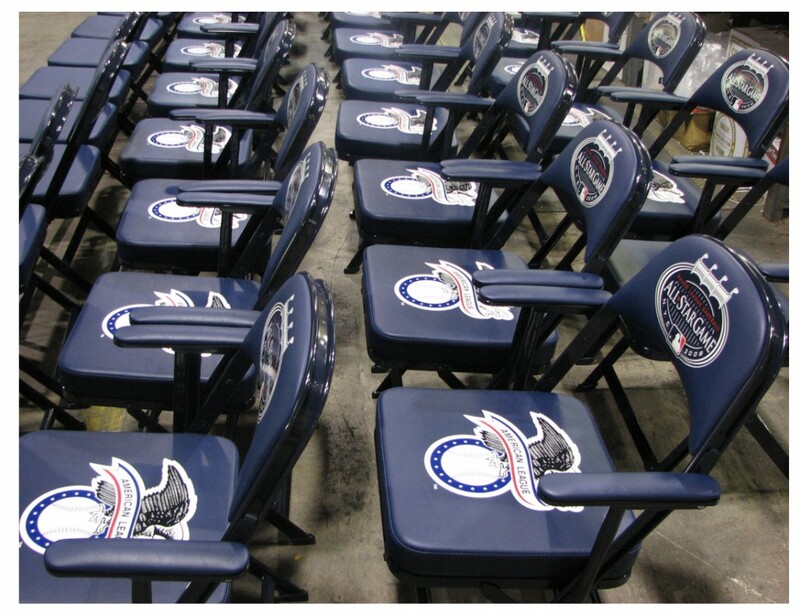 And with Athletic Seating being the only dealer that does their own custom logo printing, your teams logos have never looked better. And the Model 3400 chair is completely made in the U.S.A. If you’re thinking about upgrading the sidelines, or the locker room this season, nows a great time to get your order in. have your new sideline chairs ready for the start of the upcoming season! Just give us a call, or fill out the contact form on the website. We’ll create a proof for you, and answer any question you may have.